Contemporary Chinese art is still a young field now being opened up to critical academic research. 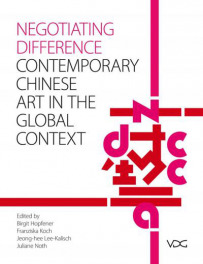 Negotiating Difference is a pioneering collection of articles which engage with contemporary Chinese art in a global context. The contributions collectively address the urgent methodological question of how to describe, contextualize and theorize artworks and artistic processes in and beyond the People's Republic of China since the end of the Cultural Revolution. The studies break new ground as they chalk out the transcultural entanglements of which art and its practices partake and which they in turn reconfigure. The book features 20 essays written by a select group of international junior and senior scholars engaged in ambitious and methodologically innovative research on contemporary Chinese art. Their multi-faceted, in part interdisciplinary approaches are complemented by four contributions by distinguished practitioners in the field, who - as art curators and critics - are located in China and explore key developments within Chinese art and the changing art scene of the last three decades.